Before airbrushing became popular in nail art, clients would sit for a full hour waiting for their nail polish to dry before a nail art design could be added on top of it. Airbrushing became our first love as the only nail art technique that, when applied properly, was dry upon contact. Its popular reemergence makes sense given the high demand for creative nail art with minimal to no dry time. Recently, I met up with Laurie Meehan, nail tech at Acrylic Creations Nail Spa in Grants Pass, Oregon, who has never put down her airbrush. Meehan stuck to this method because she loves the creativity airbrushing allows. She shares her tips and how-tos for beautiful, intricate airbrushing as we reintroduce the nail art tool that almost got away. Tip: Use a photo album to keep your stencils in one place. Stencils have come a long way since the ’90s. There are literally thousands of designs to choose from and they come in all different forms: plastic, paper and self-adhesive. Meehan prefers the plastic ones because she can spray a little cleanser on them after each use so they’re ready for the next client. To modify a stencil, she places a small piece of tape over part of the design, selecting the portion of the stencil she wishes to use, and then chooses a different design from another stencil. “If I see a shape or design that I like, I’ll figure out how to use it and make it work,” she explains. This way, you can make many designs with just a few stencils. “I use anything and everything as a stencil: lace, the ripped edge of a business card, cheesecloth, even feathers,” Meehan continues. You can also create your own with designer hole punches or an X-Acto knife and just about any material. A quick perusal of the scrapbooking section at any craft store should give you tons of inspiration. Tip: Meehan prefers airbrush paint because it’s so thin, and thinner paint flows better. Before you begin, there are a few basics you should know, such as understanding how the brush works. When air is forced through the brush, it blasts the paint out through the nozzle into tiny drops. When a drop lands on a surface it makes a dot. The size of the dot is determined by how much it has dried before it comes in contact with the surface. The more air pressure, the smaller the drops; less air pressure creates larger drops. The smaller drops make a dryer, rougher surface; larger drops make a smoother wet surface. The farther away you hold the spray from the surface, the lighter coverage you will have. The closer you hold the spray to the surface, the greater coverage. When spraying close it’s difficult to achieve nice coverage without the paint running. The goal is to practice until you find that sweet spot on your trigger where the surface is perfectly covered and smooth without any running paint. Tip: Always do a few practice sprays before spraying directly on the nails. Your spraying technique is important, too. Remember, always spray air first, then paint. To start: Air-Paint. To stop: Paint-Air. Keep your brush perpendicular to the nail surface and spray straight on. As you get better with the gun, experiment with different angles for different effects. Practice making dots and lines on paper. Creating lines that do not have dots on both ends may be hard at first but it becomes easier the more you do it. Creating a background for other nail art mediums is another way you can utilize your airbrush skills. Layering colors and stencils will give you many different looks and bring depth to your designs. Tip: Put your hand in motion before you start spraying. The initial investment for an airbrush system will set you back about $300 to $400. You’ll need a good gun, air compressor, cleaner and cleaning supplies, stencils and paint. However, in a few months and with regular use, you can count on earning that money back and be on your way to profit! Practice is the key as with all things nails. Be sure to allow yourself plenty of practice time to perfect your skills and get to know your gun. Practicing airbrushing is easy because you can do it on tips in your downtime without a model. Offer your clients some free nail art during your first month while you’re practicing. • Do not use gel top coats when airbrushing the entire nail; it will come off in one piece. • Don’t spray directly on the gel dispersion layer; it will cause the paint to run or smear. Once you become adept at this service, be sure to charge accordingly. Nail techs often fall into the trap of giving away everything for free. If you choose to practice on clients at no charge for an introductory period, make sure to inform them that it is only temporary, otherwise you’ll be doing it for free—forever. Charge $2 to $10 per nail, depending on how many colors and how complicated the design. Your pricing should reflect the fact that this service requires special paint and equipment, not to mention the time it takes to clean the gun. Tip: Don’t hesitate to airbrush toenails! Cleaning the gun in itself is a big deal and, other than practice, is the most important aspect of this art medium. Problems with air guns usually occur because of improper or infrequent cleaning. There are many nooks and crannies for paint to hide, which can cause the airbrush to fail. Dismantling the brush for cleaning after every client is not necessary, but rinsing it out after every use is. A complete dismantle for cleaning should be done from time to time, depending on how often it’s used. Know your gun; read and follow the directions for cleaning in the owner’s manual. Purchase an airbrush cleaning kit and follow all manufacturer instructions for cleaning. Meehan uses a 50/50 solution of alcohol and glass cleaner. She finds that cleaning after each use avoids the problem of paint hardening inside, rendering it useless for the next client. 1. Handy cleaning helpers: Cotton swabs, squeeze top for cleaner bottle, wire brush (the type used to clean debris from carbide drill bits), dental proxy brushes in several sizes, and a small cup or dish. 2. Acetone will turn water-based acrylic paint into gum. 3. Keep a small dish close by to corral small parts of the gun that are easily lost. 4. Don’t soak your whole air gun in cleanser. Only soak parts of the brush for short periods of time then brush off the loosened paint. 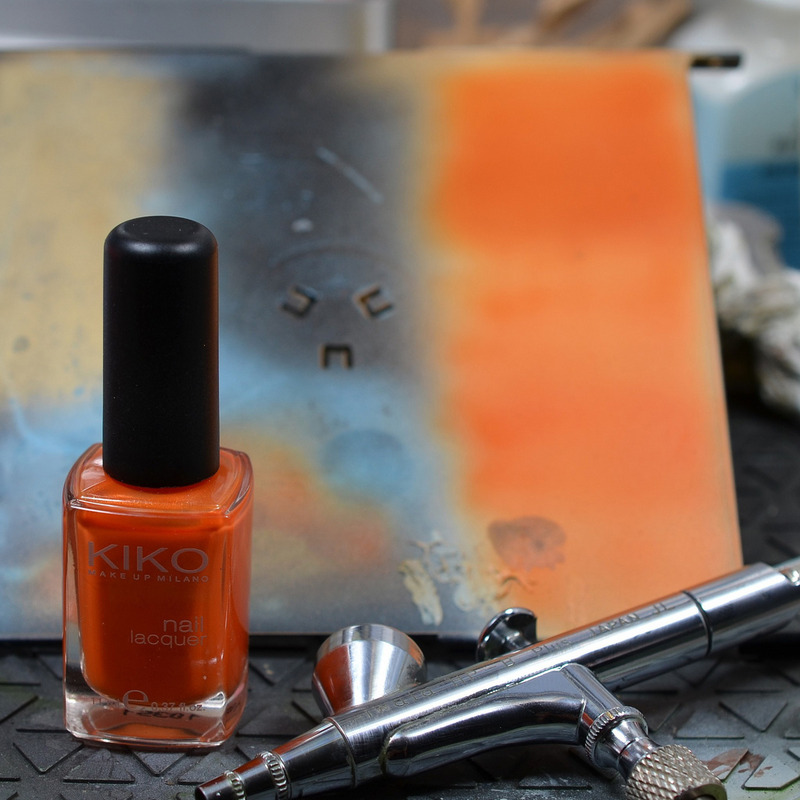 The renewed interest in nail art is a great motivator for former airbrush fans to wipe off the dust from that once-loved air gun and bring it to life again. And, if you’ve never tried airbrushing before, maybe now’s the time to start! The goal is to practice until you find that sweet spot on your trigger. Cleaning the gun is a big deal and is the most important aspect of this art medium.